Sign and share PETITIONS to help dogs abused for 'racing' and to END greyhound racing. November 6, 2018, may well be the biggest moment ever in the worldwide fight to save greyhounds. On that day, the citizens of Florida will go to the ballot box and have the power to end the cruelty of dog racing in the Sunshine State once and for all. It’s no secret that greyhounds used in racing often pay with their lives. They break their necks, suffer paralysis and some are even electrocuted. A greyhound named TNT Quiet Riot “fractured her spine" and died at the Sanford Orlando track on July 13, 2017. The very next day Rem’s Carmex also broke her back at another track in Pensacola. PorPorPitifullMe was one of several dogs who fell into the live rail and was electrocuted. 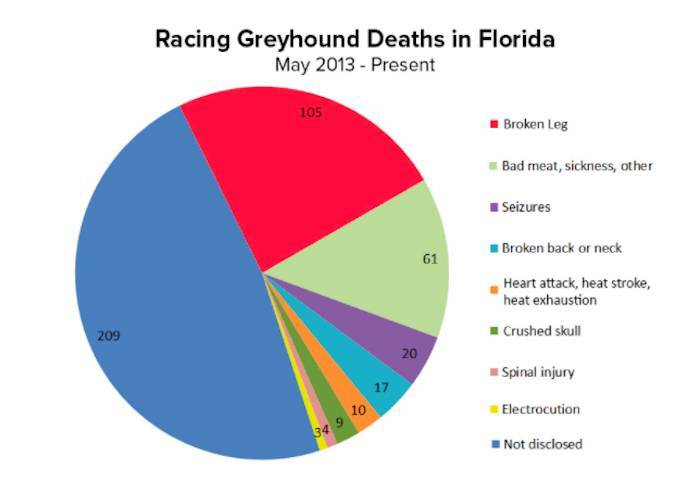 On average, a racing dog dies every three days in Florida. These dogs deserved better. They were just one and two years old. In their deaths, we see the cost of dog racing in its most heartless terms. 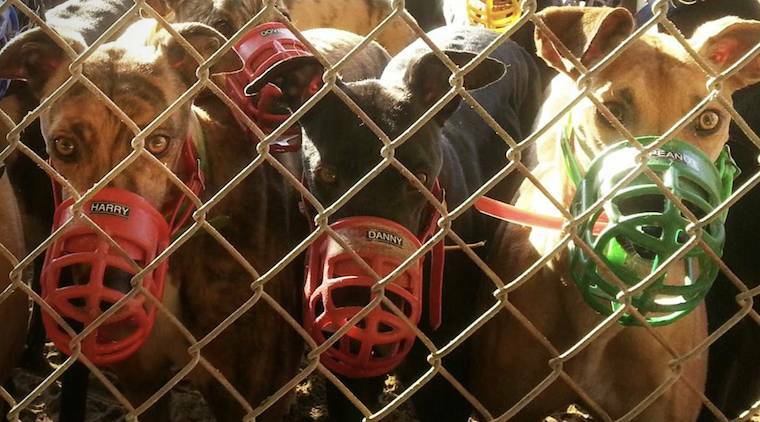 Since May 2013, nearly 500 young Florida racing dogs have lost their lives. Many suffered catastrophic injuries and died on the spot. The others could have been saved. But instead of receiving medical care for their broken legs or sprains, these gentle hounds were “given the needle.” Their bodies were placed in plastic bags and tossed away like trash. Industry reports call this “euthanasia.” We call it cruelty. Recent news about the doping of greyhounds with cocaine is only the latest example of an industry that sacrifices animal welfare for profit. In the first four months of 2017, there were 18 cocaine positives at Florida’s Orange Park Kennel Club. 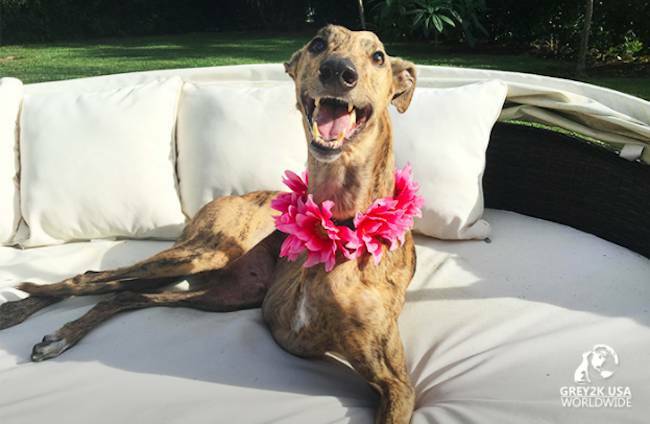 In January, cocaine was found in five greyhounds at Derby Lane, another Florida track. But Florida is not alone in its cruel, race-fixing schemes. Other states and countries are reporting drug-positive dogs at levels never seen before in a sickening attempt to make some of the fastest mammals on earth run even faster. 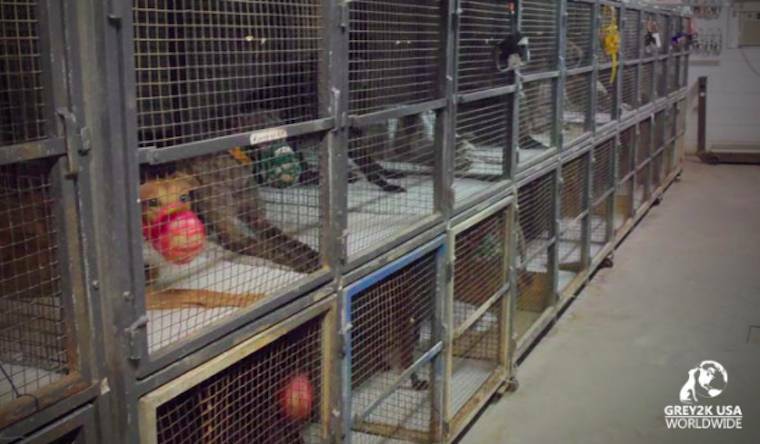 When not at the track, racing greyhounds endure lives of confinement. They are kept inside warehouse-style kennels inside stacked cages that are barely large enough for them to stand up or turn around for 20 or more hours a day. There are no toys for them and no play. The minimum size for dog track cages is 32 inches high by 31 inches wide by 42 inches deep, with some slightly larger. According to the American Greyhound Council, greyhounds stand between 23 inches and 30 inches tall at the shoulder and weigh between 50 and 85 pounds. Using these dimensions provided by the industry, this means large greyhounds cannot stand fully erect in their cages. Since there are no required turn-out times, the only extended period a racing greyhound gets to be outside of his cage is when he is trucked over to the track to perform several times a month. Otherwise, “home” is marked by the four sides of his cage. Another essential problem with dog racing is that thousands of dogs are bred every year in an effort to find younger, faster dogs. The older ones are then displaced, and their lives put in immediate jeopardy. Will they be rescued or will they be destroyed? The lucky ones who do reach adoption will then displace other needy animals (cats, dogs, rabbits, others) also seeking homes. In this way, the racing industry aggravates a homeless animal population. We believe the best answer is to get to the root of the problem and end dog racing as quickly as possible. Even as this cruelty continues, attendance is shrinking by the year. The Association of Racing Commissioners International reports a 70% decline in wagering on dog racing since 2001, the year GREY2K USA was founded. Where there were nearly 50 dog tracks in 15 states at that time, today there remain a total of 18 facilities operating in just six states. Similarly, state revenue from greyhound racing continues to drop catastrophically. Between 2001 and 2014, state dog race revenue declined by more than 82% nationwide. In Florida, the country’s biggest dog racing state, regulatory costs have now exceeded revenues by as much as $3.3 million yet dog tracks continue to receive tax breaks and other incentives. States like West Virginia continue to subsidize live racing with tens of millions of dollars per year. This is money that would be better spent on schools, law enforcement, infrastructure and other important community needs. In recent years, GREY2K USA has phased-out dog racing in many states and successfully prevented its introduction to countries such as South Africa, Jamaica and the Philippines. The organization’s most rewarding campaign involved a voter referendum in which four million people were asked to shut down the two tracks of our home state. In November 2008, Massachusetts citizens voted overwhelmingly in favor of the greyhounds, starting a chain of events that quickly led to the prohibition of dog racing in our sister states of New Hampshire and Rhode Island and more recently, Colorado and Arizona. All told, we have helped close two-thirds of all U.S. tracks, and we are now looking to apply our strategy to help end dog racing worldwide. Please sign our petition to the leaders of the eight dog racing countries today. The key to our efforts is a reliance on bona fide, official documentation only. Where previous efforts to end dog racing often amounted to a “he-said she-said” debate, we let the greyhounds speak for themselves through their own track records and photographs. Volunteer and/or donate: GREY2K USA Worldwide - Thank you! It’s time for a change, and we would like your help in making that change. Check out ourcampaign gear and please join us in our fight to end dog racing. My greyhound Gina is truly one of the lucky ones. She gives life to this struggle and reminds me that every dog deserves to be loved and protected. To learn more about dog racing, and to work with us to save greyhounds, please go to GREY2KUSA.org. Please sign our petitions, find us onFacebook and Twitter, and join the team that is working to give greyhounds the second chance they deserve.